We think fall has finally arrived in Arkansas. I am THRILLED! To sum it up, I heard the other day that this summer, the average temperature here was over 90 degrees for 100+ days. And I was pregnant. Needless to say - I'm beyond ecstatic that the heat is gone, Luke is here, my ankles are back, my chacos fit again, and we don't DREAD being outside, or break a sweat just thinking about it. With fall, there are lots of "fallish" things happening - apple festivals, motorcycle runs (Fayetteville's Bikes, Blues, and BBQ was this weekend - supposably bringing in 400,000 bikers), football (we live 30 minutes from the University of Arkansas - so much for knowing what's happening with the Big 10, I'm forced to be an SEC follower down here), and leaves just starting to change. So this weekend we had our first family outing, besides the quintessential "first trips" to none other than Sam's Club and Lowe's for Luke. On Saturday the weather was perfect. A slight chill in the air, a nice breeze, and wonderfully sunny. We heard there was an apple festival in nearby Lincoln, Arkansas and decided to check it out. Maybe we got there too late, or it wasn't much to start with, but the apple festival was a little underwhelming. The typical craft booths, carnival food wagons, and apples. Well, we think there were apples. We saw remnants of the "free apple slices"...but that was it. 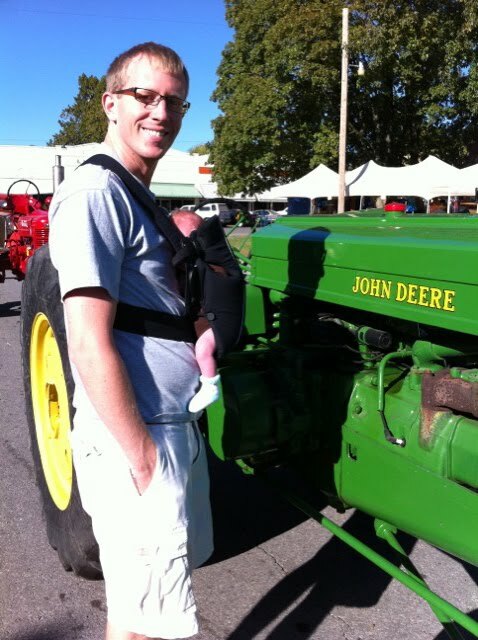 There were some antique tractors though, so in honor of the Bowsher side of the family, specifically Grandpa Bowsher, Luke's first picture with a John Deere. Thankfully, there is a lake near Lincoln, Lincoln Lake. We checked out the trail map, and decided on the 1 mile loop. Don't want to overdue it, and get reprimanded by the doctor on Wednesday. Well...let's just say, I missed a trail marker. Oops. Not a big deal really. We probably ended up hiking 2 1/2ish miles...(based on my stop watch anyway)...and we made it to this really great overlook! Well worth the extra time, and it felt SO GOOD (really better than words) to be outside, and walking, in the woods, at an almost normal pace! 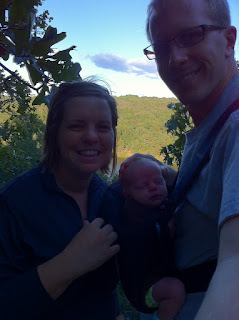 This was also Luke's first experience in the front loading backpack. He's made for this stuff. He slept the entire time! And that applesauce is SO DELICIOUS, reminds me of my grandmas, why would you ever buy store-bought applesauce, we should think about freezing another bushel but we don't have enough freezer space left, DELICIOUS! What are some of your favorite "fallish" things? A great Fall staple...pumpkin. Pumpkin bread, pumpkin muffins, and pumpkin cookies all came out of the oven this past week!